Some of you may have seen that the BIRT web site was down for a while last week. A potential security issue was discovered in the old web site, so we were shut down. Fortunately, Jason Hellman had been working on a conversion to the new Phoenix style that has been adopted by the Eclipse Foundation. Thanks to a late night (early morning?) by Jason Weathersby from the BIRT PMC, we were able to bring the BIRT web site up in the new Phoenix style. Thanks a lot to both of the Jasons (Weathersby and Hellman) for keeping the web site up. We are currently trying to update the content in the BIRT web site to reflect the changes made by BIRT 2.0. Look for lots of new and improved content as we get things posted. If anyone has a request for a particular type of content, or if they have content they would like to share with the BIRT community, let us know and we will do our best to help out. 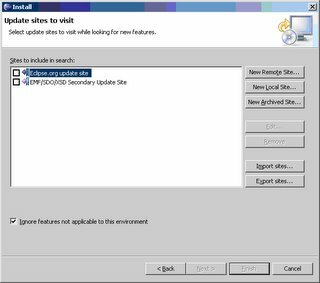 The BIRT Dev team has added support to use the Eclipse update manager to get distributions of BIRT. 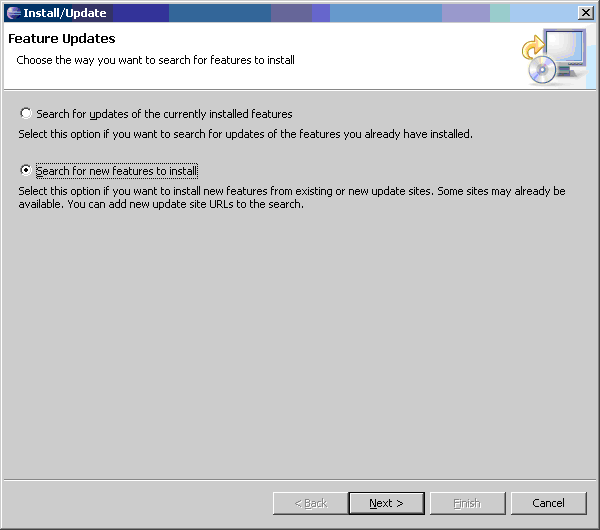 To use this feature, use the Eclipse menu system to Help => Software Updates => Find and Install. This action will bring up the Features Update screen. After adding the site, make sure the site has been checked and press Finish. 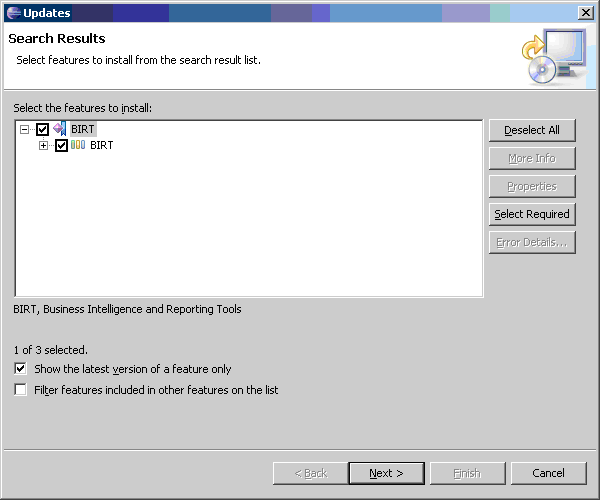 Select the BIRT checkbox and click Next will bring you to the license screen, select Next again and you will be given a choice on where you would like to install BIRT. Click Next a final time and BIRT will be installed. At this time the update site seems to be slower than a download from one of the major distribution sites i.e. ibilio or TDS Internet Services. This option only downloads the birt-report-framework distribution. If you would like any of the other downloads (RCP, Runtime, Charts…) you will need to go through the standard download site. * We are very aware that the download of these files is a nuisance. We are working with the Eclipse Foundation to clear up the licensing of these products so that they can be included in the standard BIRT download. As soon as we clean up the process, we will let you know. Often it is desirable to compose a report against a development system before promoting it to a production system. Although this could be done prior to BIRT 2.0, it required scripting. A new Database Property Binding editor is now available that speeds this process. 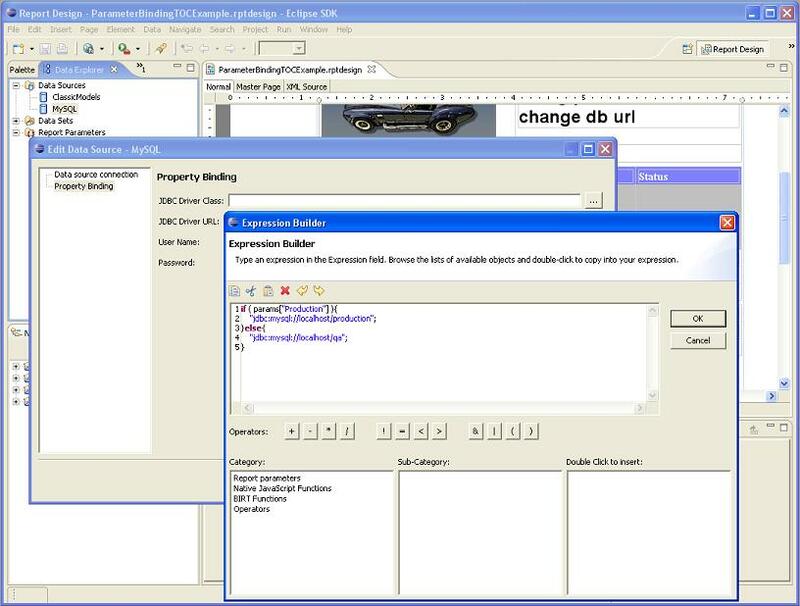 To use the Property Binding editor, edit the data source as shown below. Select the Property Binding item. 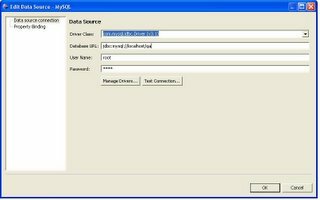 Within this editor, the JDBC Driver Class, JDBC Driver URL, User Name and Password properties can be changed dynamically. The values for these properties can be typed in or entered through the BIRT Expression Builder, which is accessed by clicking the elipse icon ("..."). 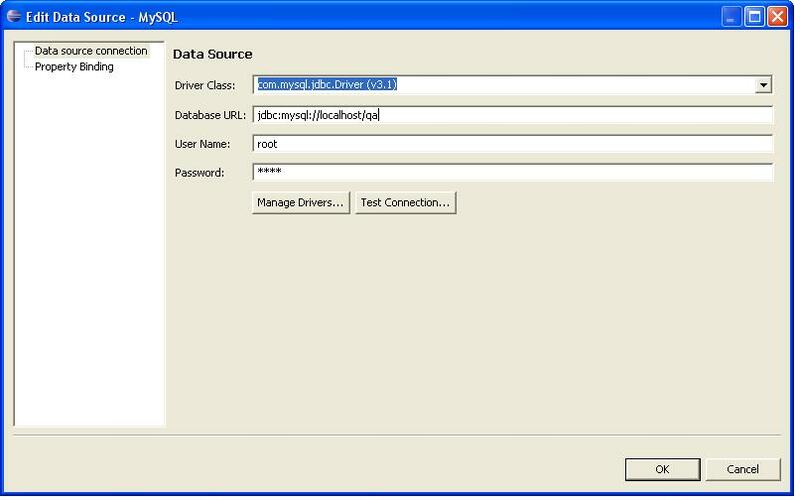 To swap the database at runtime the JDBC Driver URL will need to be modified. In this example, this will be accomplished by adding a report parameter that determines if the report is to run in Production or QA. 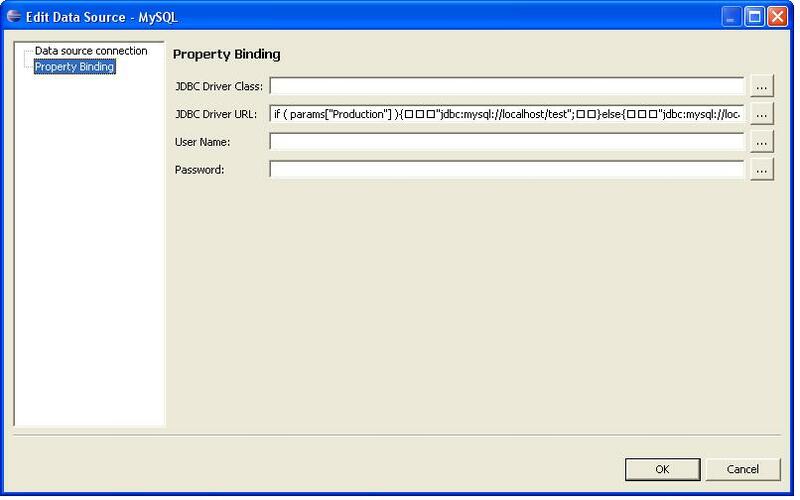 This parameter will be accessed in the expression set on the JDBC Driver URL property. The JDBC URL is swapped based on the Production boolean parameter using this expression. 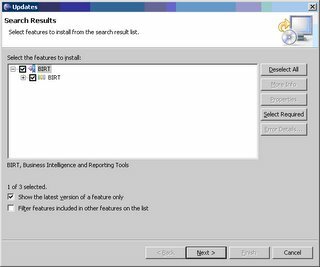 The Eclipse Business Intelligence and Reporting Tools (BIRT) team is pleased to announce the release of BIRT 2.0. Including over 200 enhancements derived from community feedback, BIRT 2.0 f eatures a new and improved viewer based on AJAX, which supports HTML pagination, CSV Output and Table of Contents functionality. We are also currently in the process of updating the web site and adding new examples to reflect the changes and show off the new features. As always we appreciate any feedback. The BIRT Team is pleased to have Mike Fox joining our ranks. Mike has over 20 years of experience in software development and project management. He is currently the Technical Lead and Architect for the reporting components of IBM/Rational’s Team Products. Mike has been very instrumental in the progress of BIRT, and has demonstrated superior knowledge on the APIs and data access layers of BIRT. We look forward to having him on the committee. Welcome to the team Mike. Currently with BIRT 2.0 RC you need to download extra files to allow the viewer to work. These files are listed in the download section of the BIRT site. This means that if you are using the birt.war file, you will need to extract it and include the required files. 1 - Download the Report Engine from Eclipse. Also get the additional required files. 2 – Extract the zip file into a temp location. 3 – Copy the Web Viewer Example directory to your JBoss installation, under the deploy directory for your configuration. Mine happened to be C:\jboss-4.0.3SP1\server\default\deploy. 4 – Rename the Web Viewer Example directory to birt.war, so it will deploy in place. 6 – Copy prototype.js to /birt.war/plugins/org.eclipse.birt.report.viewer/birt/ajax/lib directory. 7 – Copy the following six jars to the birt.war/WEB-INF/lib directory. Start up JBoss and enter the URL to BIRT (ie http://localhost:8080/birt) and run the test report. For anyone that is using BIRT in combination with the Web Tools Project(WTP), you will need to be a little careful when you upgrade to the 1.0 version of Web Tools. The WTP is built on Eclipse 3.1.1. BIRT is based on 3.1. Under some environments, particularly Linux, the BIRT plugins are disabled when upgrading from Eclipse 3.1 to 3.1.1. If after an upgrade to 3.1.1, you find that your BIRT perspective is no longer available. 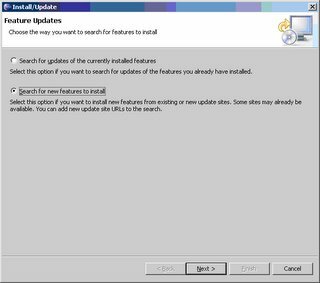 Go the Help --> Software Updates --> Manage and make sure that BIRT is enabled. A second issue may come up with the EMF and GEF plugins. WTP 1.0 uses emf-sdo-xsd-SDK-2.1.1.zip , and the GEF-SDK-3.1.1.zip. BIRT needs to have the 2.1.0 version of EMF and the 3.1.0 version of GEF. Both version of EMF anclipd GEF can be installed in the same Eclipse installation with no apparent conflict. If you are using the WTP all-in-one download, you will need to go out and pick up the 2.1.0 EMF and the 3.1.0 GEF downloads. They will need to be loaded into the plugins directory along with the BIRT download. BIRT 2.0 Release Candidate is now available. The main enhancement over the M3 release is the Viewer now supports paging HTML. In addition BIRT now supports property binding for the JDBC driver. This allows the report developer to change things like username, password, database or driver class at run time. BIRT 2.0 Final features continue to be polished. For a list of the 2.0 Features take a look at the Project Plan and Deliverables.